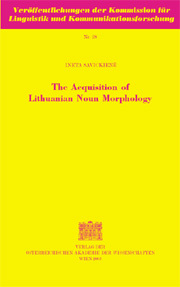 The present study is the very first to give a description of the acquisition of Lithuanian noun morphology. The aim of this investigation is to describe when and how the particular grammatical categories of the noun emerge in the speech of a Lithuanian child. It also aims at providing an interpretation of errors (i.e., a linguistic behaviour which does not match the model of adult language) and at proposing reasons why such errors occur. In addition, the results obtained by the analysis are tested against cross-linguistic data. This monograph is a thoroughly reworked and adapted English version of the Lithuanian monograph Lietuvio vaiko daiktavardzio morfologija. The work is based on the rich longitudinal data collected from the Lithuanian girl Ruta. Lithuanian is, at least in the realm of morphology, the most conservative of all living Indo-European languages, the one with the richest and most complex inflectional morphology. Diminutive formation (the other topic of this monograph) is also very rich in types and the richest in tokens among all European languages. Thus acquisition of its morphology is of particular interest.